Minimum quantity for "50W LED Light Panel 2'x2'" is 2. Please note that the minimum quantity for 2'x2' "50W LED Light Panels" is two (2) for all orders requiring shipping. If you wish to purchase a single 2'x2' 50W LED Light Panel, you can do so at our store location. At LED Montreal, we have a wide variety of solutions for your lighting needs and the LED Light Panel is certaintly one of our most popular products. If you have been using traditional fluorescent neon, this new product will definitively save you time and money. You may have seen our 20W Dual Mode LED T8 Neon Tube to use instead of traditional fluorescent neon tubes; however the installation of LED Light Panels may be exactly the solution for your needs. Whether you plan to use in a suspended grid ceiling, or drywall ceiling, these panels are great for residential, commercial and industrial applications. The LED Light Panel is great for basements, schools, gyms, board rooms, hospitals, dentists’ cabinets, waiting rooms and so much more. With up to 80% energy savings in comparison to traditional fluorescent neon tubes, and up to a 30 000 hours life span, that is 3 times more than neon tubes. Talk about saving time AND money! All you need to do is hook up a 100 to 277V AC source to your LED Light Panel and you‘re ready to go. To facilitate the installation of your LED Light Panel, you can also order the LED Light Panel Suspension Kit or LED Panel Frame Kit from the drop-down menu. If you choose to install the LED Light Panel directly on AC power, the installation should be done by a qualified professional. Ease of connection is only one advantage of the LED Light Panel! It also offers a brightness second to none that is smooth and flawless without LED dots. It can reach up to 6250 ±5% lumens with a 50W consumption (2’ x 2’ Panel). Furthermore, the thickness of this product is remarkable: 10.6mm for the panel, and 45mm including the LED Driver. - 2 ft x 2 ft Panel: This model, although slightly less bright than the 2 ft x 4 ft LED Light Panel is still great if you want a maximum light output from a LED Light Panel. It gives a luminous output of 6250 ±5% lumens. 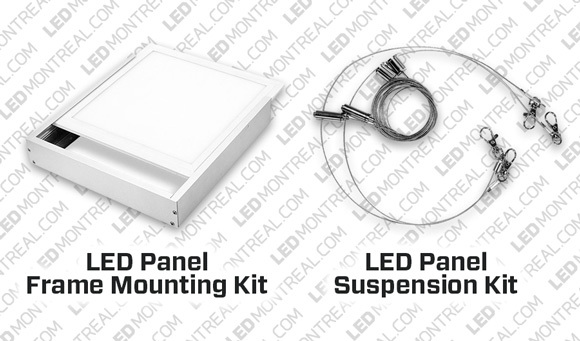 Get your 2 ft x 2 ft LED Light Panels at LED Montreal.